Lady Gaga did what she does best and put on a show stopping performance of Scheiße and Judas at the iHeartRadio music festival in Las Vegas this weekend. 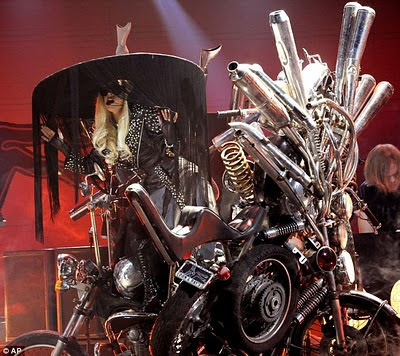 Gaga appeared on stage atop of a motorbike, that can only be described as a piece of modern art, and proceeded to sing and dance the crowd into a frenzy. I can't even imagine how much Lady Gaga spends on these one time set pieces and costumes! I'm less enthusiastic about Gaga's performances than you. She's not bad by any means but her performances just seem so erratic and unpolished to me, like she's just having a seizure on stage. She doesn't really have that big of a stage presence to me either. But anyway, have you seen the HBO Monster Ball special? How about Jennifer Lopez "live" at the same event...was she lipsynching to a pre-rec'd "live" track? She's a funny one, I don't know if I've ever seen her sing live or not. I put her into a category of 'dancers who can sing'. Here's the video: http://www.youtube.com/watch?v=Zrt9TWzU6EQ&feature=player_embedded#! My suspicions are mainly caused by her head set mic (they never normally sound so even in terms of volume) and a couple of bits where it looks like it doesn't quite match up...difficult to tell because of the quality of the video. I do agree that she seemed a little out of it at some points in that performance, particularly during the dance moves in Judas. I just realised there is a whole set from this night that I've missed out on, I need to check that out, maybe the performances go down hill. I haven't seen the Monsters Ball Special. Is it good? Yeah, if you enjoy Gaga's performances I imagine you'd love it. The whole thing's on YouTube.